THE 19th ANNUAL INDEPENDENT PUBLISHER BOOK AWARDS WERE PRESENTED ON MAY 27, 2015 IN NEW YORK CITY. 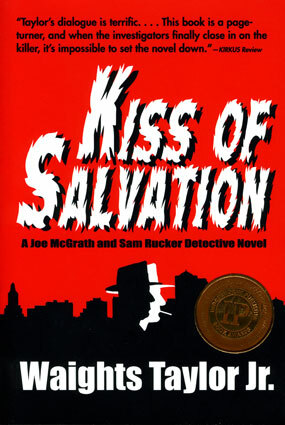 MCCAA BOOKS' KISS OF SALVATION WAS AWARDED A BRONZE MEDAL AS BEST BOOK IN THE SOUTHEAST FICTION CATEGORY. THERE WERE OVER 5,000 BOOKS ENTERED IN THE COMPETITION, AND THIS IS A SIGNIFICANT ACHIEVEMENT FOR MCCAA BOOKS AND AUTHOR WAIGHTS TAYLOR JR.
three chapters of the book. "Homicide detective Joe McGrath is on his way to Sunday morning Mass when he gets a call from headquarters saying the body of a ‘colored’ woman has been found behind a local hotel. Her partially clothed, strangled corpse is posed at an odd angle and her lips are bruised—odd characteristics that make McGrath wary. Police soon learn the woman was a prostitute, and when a second woman is strangled exactly one month later, her body again posed, McGrath fears that the town may have a psychopath on the loose. . . . Case closed? Not when McGrath’s on the case with his new teammate, African-American private eye Sam Rucker. . . . Taylor’s dialogue is terrific . . . This book is a page-turner, and when the investigators finally close in on the killer, it’s impossible to set the novel down." "The Kiss of Salvation takes us back to the dawn of the Civil Rights movement in 1947 Birmingham, Alabama. It’s a murder mystery, a history, and an in-depth study of evolving times in the American South. Deftly written and immensely readable, Taylor paints a picture of a complex era in American culture. Highly recommended." "Kiss of Salvation immerses us in the milieu of 1947 Birmingham in such a way that we feel part of the setting, and the mystery that Waights Taylor Jr. unfolds is one that captures the American psyche of that time and place. It is as American a mystery as one can find, and one that reveals the underside of the American experience while introducing two detectives who signify the evolving times prior to the civil rights movement. It is in the best tradition of mysteries by the likes of James Lee Burke and Walter Mosley, who use time and place to tether us to another time and another America we should never forget." "In his new, riveting murder mystery Kiss of Salvation, Waights Taylor Jr. takes readers back to Alabama in the 1940s, a time not unlike our own. With help from a colorful cast of characters, black and white, rich and poor, he offers a fascinating portrait of the American South on the cusp of the civil rights movement. There’s electrifying suspense every step of the way, a healthy dose of romance and real compassion of the sort one expects from the author of Our Southern Home, his exhilarating non-fiction narrative that readers from Alabama to California have embraced with a vengeance."